The cat 4 landfall intensity appears right on the money. The barometer readings on land right at landfall certainly did not justify keeping the storm a cat #5. The 938 mb reported by a tourist in the edge of the eye at Emiliano (2 miles inland) was a helpful indicator that the lowest pressure in the dead center was no lower than 932mb. 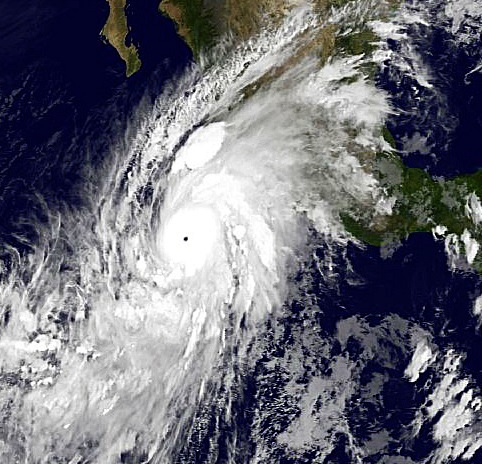 The 934 mb recorded right at the coast at Playa Cuixmala proved an invaluable piece of data. Last year I asked Chris Landea (science advisor @ NHC) how much the pressure across a major hurricane's eye could vary; and his response was, "no more than 6 mbs; usually less, of course." The intensity at max while at sea being greater than Wilma was an amazing occurrence. Considering how tight and violent Patricia was, and how fast the pressure dropped, I'm surprised they didn't down the pressure anywhere from 865-868mb (my personal opinion). Despite not being as big as Tip, I feel like Patricia might have bottomed out at a slightly lower pressure. Hurricane Andrew: the NHC prepared map below is even more detailed. The distance between the 970 mb. line and the 930 mb. line is 6.1 miles. That's 40 mb. in 6.1 miles; or 6.55 mb per mile. The distance between the 990 mb line and the 922 mb reading just north of Bauer Drive is 16 miles; which average 4.25 mb. per mile. In addition to the data on the map, two NHC supplied barometers reported: 932 mb. at Stanley Goldenberg's house (researcher whose wife gave birth that night) on SW 174 St (1 1/2 miles from the edge of the eye); and 942 mb. at my house on SW 156 St--which is a distance of 1.1 statute miles from Goldenberg's house. So, over that short distance of 1.1 miles between Goldenberg's and my house there was a 9.1 mb per mile pressure gradient. Fujita's study and the NHC study of the damage both estimated in that one mile zone the sustained winds were 145 mph, with gusts of 175 mph. Which makes the 20.8 mb per mile gradient in Patricia absolutely insane, as noted in the previous post. Last edited by beoumont on Wed Feb 10, 2016 8:45 pm, edited 1 time in total. It's been long enough so now it's time to ask: is Erika even being included as a tropical system for 2016 to start with? It's a bit odd that we're into February and the report still isn't out yet, despite the strongest of each basin both having come out already. Hammy wrote: It's been long enough so now it's time to ask: is Erika even being included as a tropical system for 2016 to start with? It's a bit odd that we're into February and the report still isn't out yet, despite the strongest of each basin both having come out already. Maybe there are some difficulties in the position estimates as Erika is a rather disorganized system and the operational track needs substantial smoothing as well. Dolly in 2014 also comes out quite late due to similar reasons. Sandra is out. Peak intensity raised to 130 kt. Jimena is out. Note that it includes the post-analysis of the CPAC stage. Which is why Olaf makes sense as the last one, since it has 2 EPAC stages. CPHC actually released a TCR? What world is this? In seriousness, glad they upped Jimena. Looked like a Cat 5 to me but Dvorak never supported it for some reason. 1900hurricane wrote: Erika is complete. The biggest change is that the time of dissipation moved up about 24 hours, to the morning of August 28. Operationally, it was declared dissipated on the morning of August 29. Olaf is now out (complete), as are the updated BT's for Iselle and Julio from 2014 (finally incorporating CPHC data). Notice that Iselle was a Cat 2 as it approached Hawaii, but weakened rapidly (it does not have a landfall time in the text, but from the BT placement it looks like 55 kt was the landfall intensity). Guillermo and Hilda updated to include CPAC portion. Hilda's peak bumped up to 125 kt. CPHC has released a few reports over the past several months. The reports for Tropical Storm Malia, Tropical Storm Niala, Hurricane Oho, and Tropical Depression 09C are now all out. The ones we're still waiting on are for Halola, Iune, Kilo, Loke, and 08C, as well as the CPHC portion for Ignacio. Additionally, JTWC released their 2015 Annual Tropical Cyclone Report a while back. CPHC has released their portion for Halola (no changes) and the report for Loke (some adjustments). Still waiting on Iune, their portions for Kilo and Ignacio, and 08C. 08C is now out. Iune and CPHC portions of Ignacio and Kilo are still standing. After three years,they released the Iune report.I dont know what were the details of report that caused the delay. Maybe our friends 1900hurricane and CrazyC83 know. cycloneye wrote: After three years,they released the Iune report.I dont know what were the details of report that caused the delay. Maybe our friends 1900hurricane and CrazyC83 know. Probably CPHC never got around to it. They don't have the staff that the NHC has, especially from a hectic year.